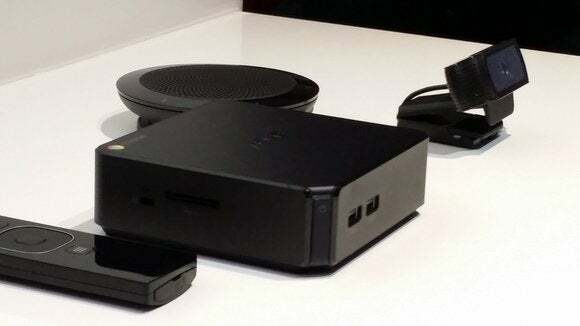 At this point, Google is just calling the system “Chromebox for meetings.” Caesar Sengupta, vice president of product management for Google, said that the system was designed and is used internally at Google. “We’ve found that this works quite well for Google, and we’re happy to bring this to other companies,” he said. 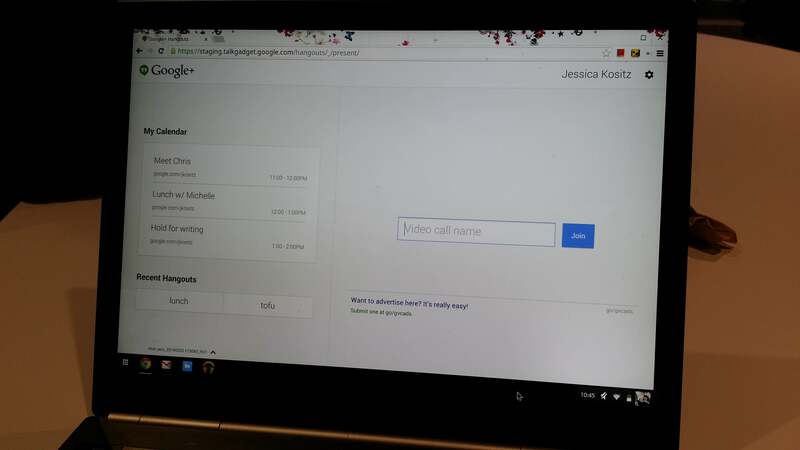 Once joined to the conference, participants will see a Hangouts-style interface, according to a demonstration by a Google representative. Users will also be able to type in a special URL, g.co/present, which will allow participants to “volunteer” to share their screen. The participant will then be able to open a Google app in a separate tab and launch a presentation, for example. A Google representative said that each Google system (what Google refers to as a "meeting room" will include its own management account, that users will be able to connect to and "schedule" a meeting on their own calendars. Participants who are working from home, or don't use the system, can be connected to the meeting via Gmail, using Hangouts from a PC, Chromebook, Android phone, or anothr device that supports Hangouts. Vidyo will also provide a special tool to connect to its videoconferencing systems, and users can also join via a number from UberConference. There’s a bit of a catch: Each system will also come with a $250/year management fee. The first year is included, Sengupta said. In return, Google will provide an undisclosed level of SLA guarantees, continue to provide software upgrades, and other improvements, Sengupta said. “Over time, you’ll see more and more management features baked into this,” he said. Google's Chromebooks have quietly emerged as a force in the low-end computing market. Will this videoconferencing capability be what the Chromebox needs to make the same inroads into the business market? Microsoft and its partners will be guarding their territory jealously. Updated at 11:28 AM with additional details.